Do you have a wedding planned in 2018? Well, apart from your fancy venue and dream gown, have you thought about wedding cover? You've ticked off everything on your to-do list and perhaps place your trust in all your suppliers but might not have considered what will happen if one of them can't deliver. What happens if you paid a massive deposit that you've been saving for years, only to have the banquet hall have a massive flood or a fire wipe out the 200 guest seats? Or what about a destination venue that's just been sold and no longer available to hire? Or, due to extreme weather or illness in the family, you need to postpone your big day. Heck, you have to think about anything that could go wrong especially if you're planning a wedding complete with horses. I read something about the need to have them covered by third party insurance in case someone is injured or property is damaged. My top cake tier was too heavy for the bottom tier, so the entire thing started collapsing. In the end I had two separate tiers! The venue also forgot to lay down a carpet in the aisle, so my veil hooked on the wood with every step I took. I had my ceremony in the garden of my reception venue and it was so windy that the arch basically blew away! This did happen before I got there, but when I arrived like half the arch was missing. I was maid of honour a few years ago at a friends wedding. At the reception I heard a crunch and a thud. I turned in horror and saw the one tier of the wedding cake had collapsed. There are also several versions of the same story of couples signing a contract and paying for a service like photography, only to never see the person pitch on the day. • A groom was involved in a bar fight, got badly beaten up and ended up in the ICU two days before the wedding, which meant the wedding had to be cancelled. Their guests had flown to SA from overseas and food was already purchased for their wedding. 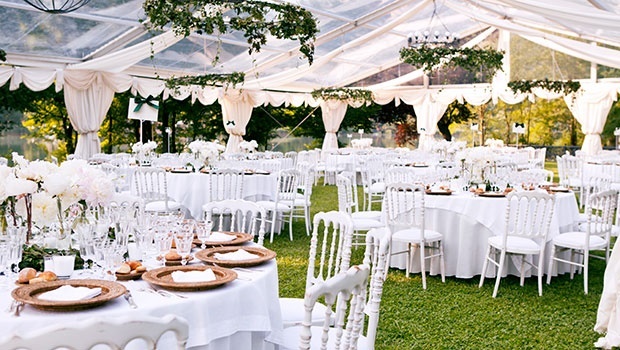 More than that, the venue and caterers charged them the full venue fee. • At another wedding, guests got drunk and broke a toilet seat in a bathroom. The seat was not available in SA and needed to be imported at a cost of R3 500 which the wedding couple was responsible to pay for, eeuk! Yes, the worst moments can happen during what should be the best time of your life. • In a tragic event, a bride was involved a plane crash two weeks before the wedding and didn't survive. Although the venue had to charge for certain costs, they also offered a discount due to the circumstances. 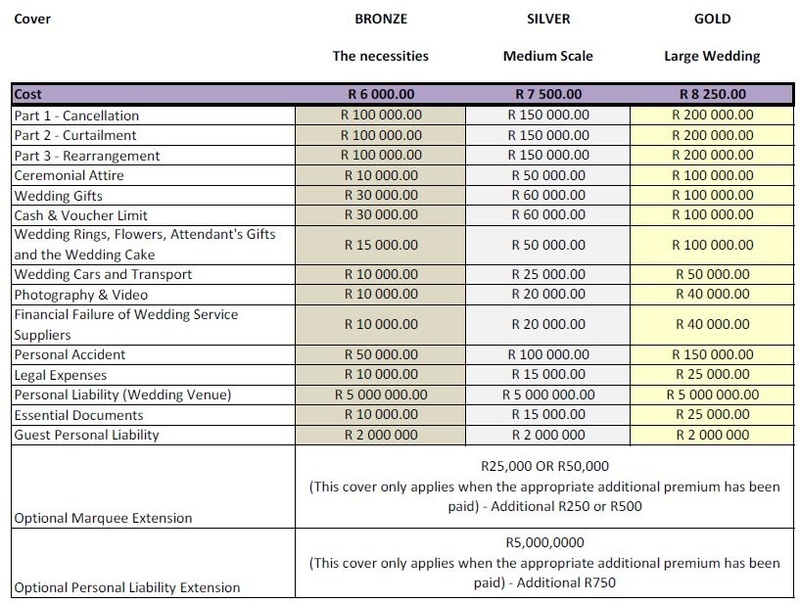 With the average wedding cost in South Africa ranging between R150 000 and R650 000 (excluding honeymoons! ), it makes to consider some kind of cover. Like household and car insurance, general wedding insurance policies cover many different issues/scenarios. It may seem like an unnecessary additional expense, but at least you'll have peace of mind knowing that you've protected the large deposits you've made. And there are insurance policies that are relatively inexpensive. We chatted to Fiona Fitzpatrick from IF Administrators and Michelle Tillburn from Suretimes Insurance Administrators, both of whom are in the process of structuring wedding insurance packages to be released this year. Fitzpatrick explains that IF Administrators have been developing a wedding insurance product, called Wed Safe, which will launch next month at the FAB Bridal Expo. Wed Safe will include covering the risk of cancellation of the wedding, failure of suppliers, loss or theft of or damage to property, personal liability and legal expenses that could arise in connection with weddings and wedding receptions, including civil partnerships. Fitzpatrick adds that it is the wedding couple's duty to ensure that they purchase the correct limits of cover suitable to their needs and that in order for a claim to be handled efficiently, particular documentation like in order for a claim to be handled as quickly as possible. The packages includes three-tier levels ranging from R100,000 up to R200,000 with cover starting from just R6,000. "We may require documents such as confirmation from an expert that damaged property is beyond repair, medical reports from a doctor, contracts signed with the relevant wedding contractor like florist, photographer, wedding coordinator, etc. "In the event of any incident which is caused by theft, attempted theft or malicious or criminal damage should be informed to the authorities within 24 hours and the reference number submitted with the claim," she adds. Whatever the size of your wedding and your budget, Wed Safe will likely have cover available to meet your needs. The packages includes three-tier levels ranging from R100 000 up to R200 000 with cover starting from just R6 000. There is also a fully customisable solution should you require more cover. Here is a summary of their various cover levels available. *There are significant exclusions and it is best to contact them for full details. Wed Safe cover is available immediately through IF Admin but will only be available to purchase online once the site is live. We also got in touch with Suretimes. Tillburn explains that their new wedding protection cover, called WeddingSure, is scheduled for launch in July 2018. They will be offering four policy types with increasing levels of cover from the Basic Package for smaller weddings, up to the Sophisticated Package which offers the couple higher levels of cover. The only thing these insurance policies don't cover? A runaway bride or groom. This means that all policies will include cover that includes things like cancellation, postponement and rescheduling of the wedding, loss or damage of the bride's dress, groom's outfit, wedding rings, gifts and cakes. And also public liability. "An example of a claim under this section would be if a guest accidentally knocked over an expensive vase belonging to the wedding venue," she says. Best to be realistic. I mean, we all have that one clumsy friend. Tillburn also advises that you purchase a wedding insurance policy as soon as you make any bookings or pay any deposits towards your wedding. However, if you’ve already arranged services or paid deposits, she adds that anything already booked or paid for will be covered from the purchase date of the policy – provided you have a written contract. *The WeddingSure product is still in the development phase and will be launched as soon as agreements with suitable risk carriers are finalised.